Being poikilothermic animals, fishes are unable to produce their own body heat. 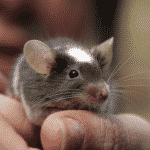 They have to rely on the temperature of their surroundings to keep their bodies in its top shape. But as different species have varied ideal temperatures and a water tank in a cold place wouldn’t always be warm, the need for the best aquarium heater is essential for most fish habitats. Anyone who lives in a region where the temperature tends to drop every so often should actually use one of these electronics on their fis﻿h tanks to ensure their pet’s good health. Luckily, shopping for the best heater for aquariums isn’t as big as a chore as shopping for filters or air pumps. 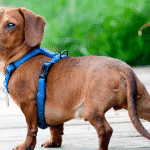 Sure, you still have to consider a few things to make sure that you’re getting the right one for your pet, but it shouldn’t be utterly overwhelming. With the help of this guide, you can even make your search simpler, so make sure to read all the way through as you might just find yourself the best unit with our product suggestions. The heater you should choose should be large enough to provide heat to your entire tank. So if you have a large tank, your heater should be appropriately sized and powered. It will be useless to use a small and underpowered heater on a massive aquarium as it won’t do a good job at regulating its temperature. Tank size is also a factor when choosing the right lighting. Because your heater will play a huge role in the livability of your fish tank, you’ll want it to be made with high-quality materials and craftsmanship. Glass and plastic are just a few options available. Titanium ones are, on the other hand, less common and therefore titanium aquarium heater reviews are very rare. The best aquarium heaters are also designed to be configured in different ways. Submersible units tend to be the most popular ones today. There are also undertank heat mats that you place beneath the tank or opt for inline heaters that you attach to the plumbing of your tank’s water inlet. For the ultimate convenience, you can opt for fish tank heaters with a thermostat. This will let you monitor the temperature inside your tank, guaranteeing that your pet is comfortable all the time. Some units don’t come with this feature, so it’s really up to you whether you want it or not. You can always use a thermometer to get the job done, but an automatic feature like this will make your pet parenting easier, so it can be a splurge some folks are ready to make. Some heaters can only offer a single temperature setting while others have adjustable heating capabilities. You might want to opt for the latter as they tend to offer more flexibility for your pet’s wellness. Accuracy is also another thing you should aim for, as your heater may claim to be at a certain level but it might not actually be providing even and enough heat all throughout your tank. After knowing what to look for in the best aquarium heater, this list of the best aquarium heaters will help you get started on your search for the right match for your beloved pet’s habitat. The first thing a lot of people look for in a fish tank heater is an innocuous and unintrusive design. As these units often go right inside the tank, most people think that the best aquarium heater wouldn’t look too out of place inside their aquatic pet’s habitat. With this Aqueon Pro Heater, you might just have found your match. With its stick design, it has a very simple and minimal appearance that won’t take too much space and look too prominent inside your tank. This makes it a great option for those who want their aquarium look as beautiful as possible. It won’t sacrifice your convenience, however, as it still has a control dial located at the top of the unit so you can easily select the setting your tank needs. No more fussing when adjusting the temperature as all you have to do is turn the dial and you’re all good to go. This unit is also equipped with an indicator light that will tell you if it’s still on or not. If a red light is on, it means it’s adjusting the temperature. A blue light means it’s monitoring the water temp. If you’re worried about its placement, fret not. As this product is fully submersible, you can configure it whichever way you want. It might be best if you can keep the dial out of the water, though, so you can easily adjust it should there be a need. Lastly, as this Aqueon heater is made of thermoplastic, you shouldn’t worry about it hurting your pet in any way. It won’t get too hot to touch, so it won’t burn your fish if they ever bump into it. It should still be kept away from other tank items that might get damaged by heat, however. While having lots of features is surely an advantage for many other products, water heaters don’t really require tons of other capabilities to be very useful. This is especially true if you just need to keep your fish tank’s water at a specific temperature and nothing else. Other features might only encumber the unit and make it more prone to damage and a surge in price. So, if you just want your pet to swim in warm water, Tetra’s HT Submersible Aquarium Heater is worth checking out. This product doesn’t need you to keep on monitoring the water’s temperature in your fish tank as it comes with a built in thermostat that will monitor and maintain the water at about 78F all the time. It requires no manual adjustments - just place it in your tank and plug it into a power source, and it’s good to go. Equipped with an indicator light, it’s very easy to monitor this product’s performance. A red light means it’s warming up the tank, while a green light means it’s monitoring the temperature. Its thermostat also serves as a signal to the unit’s auto shut-off feature. With this, you won’t have to worry about your tank overheating as the unit turns itself off once it senses that the water is getting too hot. This is another handy feature that will help keep your pet in good health and perfectly safe. While it’s not exactly the prettiest in the bunch, it's very affordable price makes up for it. Just don’t get tempted to stash it under a decorative piece as doing so might affect its effectiveness. Not a big fan of plastic heaters? Well, this Hydor aquarium heater review will change your opinion for sure! Glass aquarium heaters are also very popular so you can be sure to have enough options to keep your pet fish warm. Hydor’s Theo is a popular choice for many as it can do a great job and is available in different wattage varieties to match a wide range of tank sizes. What makes this product a popular option is its shatterproof construction. Touted as the first shatterproof glass tube heater in the market, this product promises to deliver fantastic results without putting your pet at any kind of risk. This choice of material also helps make it look elegant so you can be sure that the heater won’t be too distracting inside your fish tank. In terms of functionality, the Theo offers full control on the heating aspect of your tank. A large dial is found at the top of the unit so you can easily adjust it according to your preferred temperature. Designed to be fully submersible, some Hydor aquarium heater reviews also note that they liked its auto shut-off feature. If the heater detected that the water level decreased, it will shut itself off, which ensures that it won’t cause your tank to overheat and put your pets in harm’s way. This, however, requires the unit to be fully submerged at all times. Available in seven different sizes, you can find the right Hydor Theo for water tanks 2 to 80 gallons in size. Sometimes, if you really want the best product, you should be ready to compromise a little. In the case of the best submersible aquarium heater, looks can be less important than functionality. This is quite true with the EHEIM Jager as this heater has an old look to it but all the modern features that will make it convenient for you to keep your fish tank at its optimal condition. Despite its “old” look that is made in Germany, this product is also loaded with lots of great features that make it an excellent pick for a quality heater. It looks and feels sturdy and well-made, so you can count on it to last years of regular use. Its shatterproof construction is also an added bonus that features a heat shield and crevice-free design, guaranteeing that pets won’t get burned even if they get in direct contact with the unit. So not only is it quality-made, but it’s also perfectly safe for use as well. This durable construction also guarantees that temperature fluctuations won’t damage the heater. In combination with an automatic shut-off feature, it promises to keep the unit intact even when it detects low water levels or if it was turned on while dry. Fully submersible and equipped with the TruTemp dial that recalibrates the unit to ensure accuracy, the Jager is also ideal for both fresh and marine water tanks. This makes it highly versatile, so even if you need to switch around your heaters in your different tanks at home, it can still do a great job at keeping your pets comfortable. Don’t have the time to keep using a separate thermometer to check on your fish tank’s temperature? It might not seem like a big hassle, but if you think about it, a heater with a temperature display can really make your life as an aquarist and fishkeeper a lot simpler. So if you’re not very particular about the look of the heater you’ll put inside your tank, the Fluval E Electronic Heater can be the best freshwater aquarium heater for you. Despite its appearance, this unit is packed with great features. Its most popular offering is its LCD display. It notes the temperature inside your tank in Celsius and Fahrenheit, so you can easily monitor the water’s warmth. It will also change colors depending on the temperature. Red will be too hot, blue too cold, and it will flash in case of extreme temperature swings. The temperature is manually adjustable as well, so you can quickly set up the unit before fully submerging it into your tank. Another fantastic feature this product offers is its dual sensor system. This ensures that the water inside your tank will be kept at its ideal level, guaranteeing your pet’s comfort around the clock. Fluval E also has a memory that will keep your temperature setting even if it lost power, so your pet won’t have to endure being too cold or too warm after the unit turns back on. Designed not to have parts that will easily break, it guarantees years of use, making it worthy of its relatively higher price. You can also choose from four sizes to match your tank’s needs. 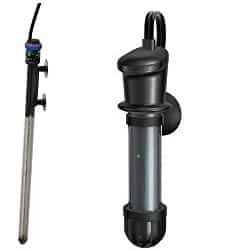 After receiving a decent amount of positive aquarium heater reviews, the Aquatop Quartz Glass Submersible Heaters have surely become one of the top options for fish tank heating, thanks to its great features and affordable price. Best known for its simplicity, this unit has everything you need to keep your pets happy and healthy inside their tanks with its essential features and quality construction. The first thing that you’ll notice about this product is minimal design with a clear temperature indicator at the top. While you’ll know right away that it’s a heater on first glance, thanks to the numbers etched on the unit, it won’t be too distracting inside your tank. It also simplified temperature monitoring as you can quickly see right at the heater what the current temperature the tank has. Made with insulated glass, it’s also guaranteed to be durable. It won’t easily break or get too hot and hurt your pets. Like other submersible heaters, however, it’s best to place it near a water flow and away from other accessories inside the tank to prevent melting and damage. Another high-quality and affordable fish tank heater that you might be interested in is the Zacro AH039. This unit is made from heavy-duty glass with internal seals that allow it to be fully submersible and effective in providing ample heat for tanks up to 16 gallons in size. Contained in a durable plastic material, it guarantees that it won’t get too hot to scald your pets inside the tank. Despite its low price, however, it still comes with a temperature monitor. This comes in handy as you can adjust the temperature, letting you tweak the unit to provide your desired temps. While the display isn’t digital, it can still be pretty accurate and reliable. Also because it’s so affordable, expecting this unit to be the most advanced shouldn’t be the case. It can do a great job at keeping your tank warm, but you can’t expect it to have the latest technologies in heating. It actually has a pretty simple mechanism and cycles heat every five to ten minutes, ensuring that your tank will always be at its optimal temperature.